It's called Backcountry Axe for a reason - many actually - starting with its GRN handle with solid fiberglass core, joined to the cutting head for increased handle strength. Its forge head gives it increased strength and durability, while a cutout decreases friction when cutting. The flat back is perfect for hammering tent steaks into hard ground. 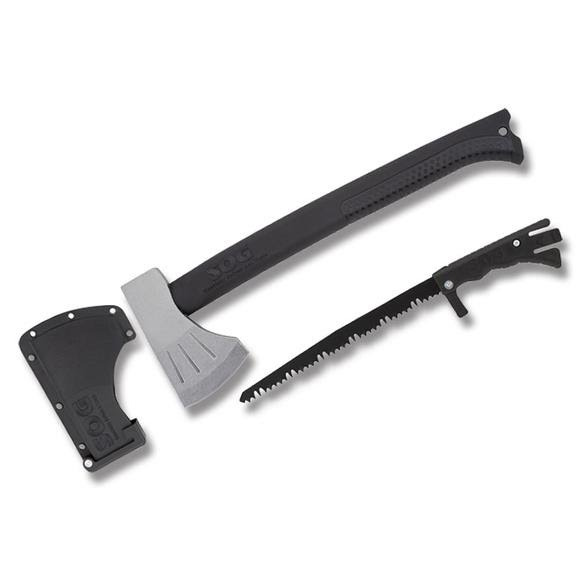 It&apos;s called Backcountry Axe for a reason - many actually - starting with its GRN handle with solid fiberglass core, joined to the cutting head for increased handle strength. Its forge head gives it increased strength and durability, while a cutout decreases friction when cutting. The flat back is perfect for hammering tent steaks into hard ground. But baddest of all is the saw hidden in the handle, featuring an auto-deploying hand-guard. With two tools in one, you can clear twice the brush, twice as fast. Then stow it in its molded sheath with belt clip for safe and secure carrying.